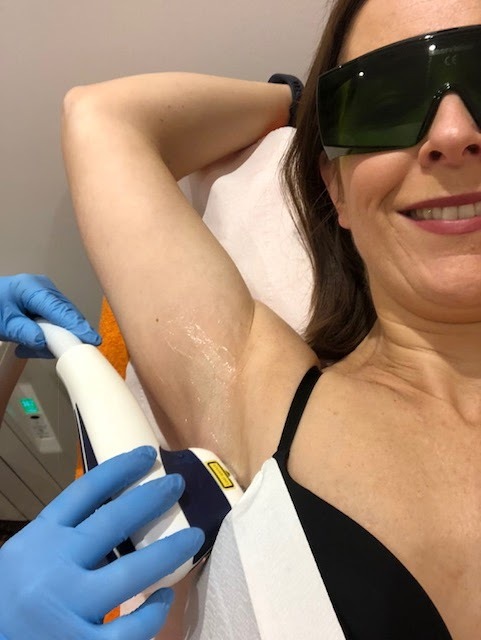 Since I did my swimming lessons last summer, I've been mulling over laser hair removal. But I had all the usual concerns about cost, effectiveness and pain. Given I'm a '5 minutes in the shower' kind of hair removal girl, would it just be more hassle than it's worth? Then we booked our holiday - the first time in a bikini for 10 years. It was time to do some research. It's definitely something you need to get recommendations for as I've heard lots of mixed reviews from different places locally so when my skincare go-to expert, Katrina Doran (who blogs over at The Beauty Equation and has a brilliant Instagram profile) told me to speak to her friend Judith from The Laser Clinic, I did. 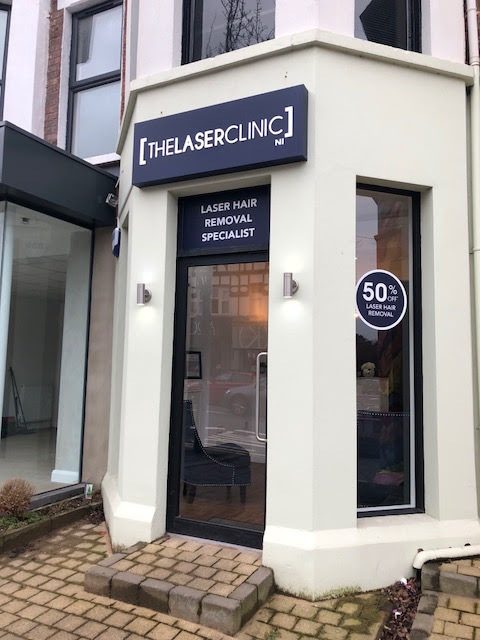 The Laser Clinic is long time established in Ballymena but just recently opened close to me on the Lisburn Road, Belfast and I had driven past a few times and admired the lovely frontage and waiting area. I exchanged some direct messages with Judith and a date was made for me to come into the Belfast clinic. I should say now that Judith, knowing I have the blog, offered to do the two areas free of charge in return for me telling everyone about her new premises in Belfast and the offers they're running. Basically, the darker your hair, the the more effective the laser treatment is. I was told that my bikini area would work well but my underarm would be less successful. I really appreciated this honesty and decided to give the underarm a go anyway, knowing that even if it wasn't a 100% success, it would still be better than it is currently. Josephine then tested the laser on my inner arm and a date was booked for my first treatment. I left with a comprehensive list of instructions for pre and post treatment - really useful for referring to once you're home. I always sit and nod when I'm told things like this in beauty salons and then promptly forget it all once I'm home. Anyone else? For my first treatment, I had to arrive at the salon with completely clean, product free skin. On the day of the treatment, I had to shave the areas being treated. This is important for the bikini area in that you need to shave the shape you want, e.g. low/brazillian etc as the laser works on hair free skin. 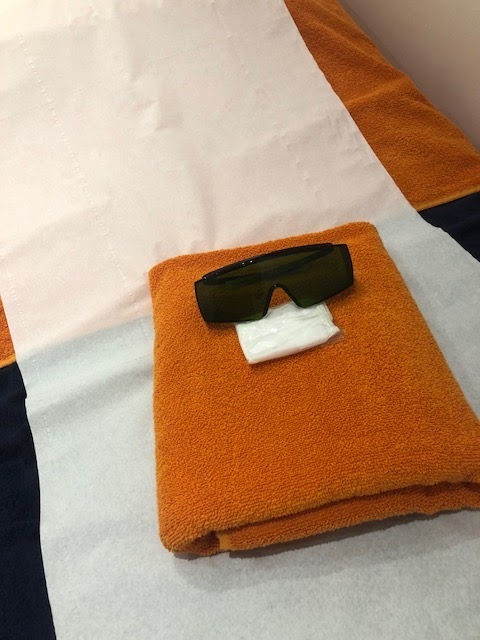 This was what greeted me in the room - a towel for modesty, paper knicks and some funky protective glasses! The treatment took about 20 seconds under each arm and a couple of minutes on the bikini area. Just like having an ultrasound, clear gel is spread on the area to be treated but that's the only product that's applied to the skin for the duration. The laser feels like tiny pin pricks and honestly didn't hurt at all. It's mildly uncomfortable at the very worst but is over so quickly, you don't even have time to register the pain. I've only had one treatment but the reason I'm blogging so soon is because you need to have several treatments on each area before you're hair free and each treatment needs to be 6 weeks apart. So if you're going away this summer, you need to start the treatments pretty fast. 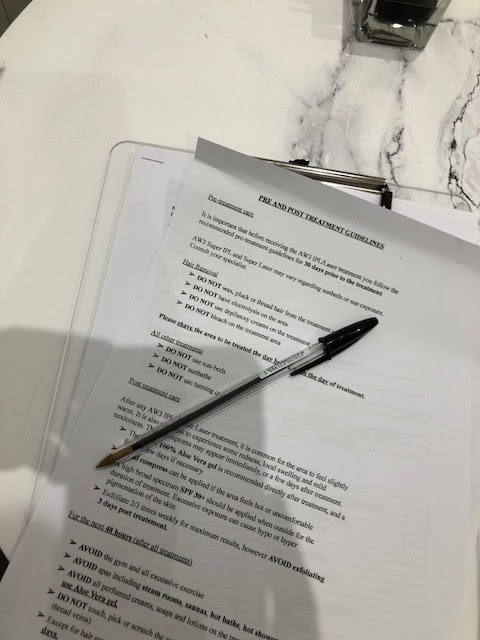 I'll keep you posted via updates to this blog post as I continue my treatments but what I can tell you is that even though I was told you only start to see results after the 2nd or 3rd one, I have seen a difference already and I'm really encouraged by this. And what's great about The Laser Clinic is that you pay per treatment so you only pay for as many treatments as you need. It works best on hair that has pigment so the darker you are, the more likely it will be to work. You will be assessed before any treatment will commence though and advised on the likely success rate. 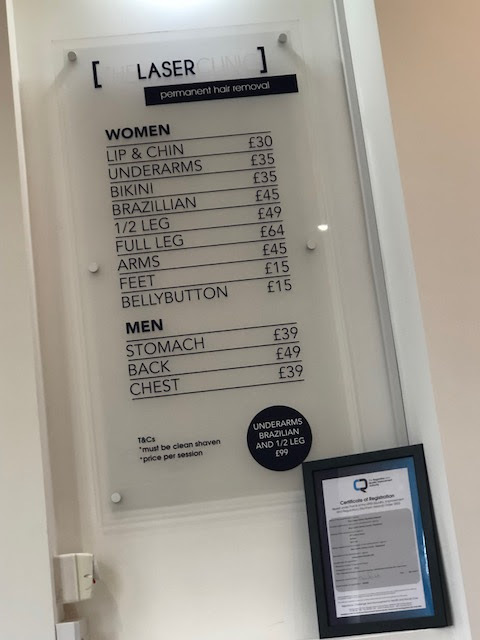 Typically it's legs, bikini and under arm that are the most popular but you can pretty much have it done anywhere and the clinic will treat men and women. In my case, no, though everyone is different. I felt no more than a pin prick of pain occasionally during the couple of minutes the laser was on my skin. My bikini area was marginally more painful than my underarm. How long/how many treatments does it take to work? Again, everyone is different but most people will need 5 or 6. Results start to be seen after the 3rd treatment. How do I manage regrowth between treatments? In between treatments, you continue to shave as necessary - no waxing allowed. Thanks to Judith & Josephine for my treatments and watch this space for the updates! Oh and do feel free to message me with any questions you might have that I've not answered here.